Ralph Casey Lewis of 171 East 100 North, Kaysville, Utah writes, that his direct ancestors, John Lewis and Margaret Fredenburg were married on Nov. 24th, 1833 in Campbell, KY. According to Ralph, Margaret's partents were Isaac Vredenburg, who was christened Oct. 11th, 1772 at Galatin, Colubia County, New York, and Geessje Cohl. He mentions that he has records on several generations going back, but does not have a date of dirth for Margaret, who was born around 1812. The only son of John and Margaret he knows about is Alexander Lewis, born Jan. 18th, 1840 in Covington, Kenton County, Kentucky. Alexander came to Linn County, Iowa in the spring of 1851, at the age of 11 years. In June of 1855, he came to Richland, Jones County, Iowa. Anyone who knows anything about any other children of John and Margaret, contact Ralph Casey Lewis at the above address. Mr Lewis has also sent in a multiple page GEDCOM printout of his family, which will be published in future issues. Other GEDCOM and computer generated charts and files will appear in future issues at a rate of 2 to 3 pages per issue. Readers are encouraged to send all types of material that you would like to share with others, as the Vredenburg searcher mailing list is growing fast. Wilma Hofheins of 70 N. 1200 E. Mapleton, Utah is searching for information relating to Martha Ann Vradenburgh, born cir. 1820 in Vermont. She was living in Essex Junction, Chittenden County, Vermont, when she married John Weeks, also of Essex Junction on December 15th, 1836. According to town records, they had four sons, when they moved to WS. In 1856, where a daughter was later born. Maria died sometime after 1861. In the Vermont Essex Junction Cemetery is a gravestone that reads Abigail, wife of Wm. Van Vreadenburh who died April 9th, 1845, aged 49 years. Wilma is inclined to believe that William and Abigail are the parents of Martha Maria, although she has no proof. I think there is a good chance that Wilma is correct in her assumption. If anyone can add anything to Wilma's story, please contact her at the above address. Michigan Genealogical Notes Ann Monnier of Molalla, Oregon has sent in some more research notes on some Vredenburgs in Michigan. As you remember from the previous issue, we have published some 1850 census listings for this family as there is a large focus on Michigan. I myself had Vredenburg ancestor in Livingstons County, Michigan, before they moved in Ionia County, Michigan in the 1860s. Ann notes that the above Joseph may be connected with Henry Vredenburg's line. The Castle Vredenburg or sometimes Vreeburg was built during the time of Spanish rule of the Netherlands. 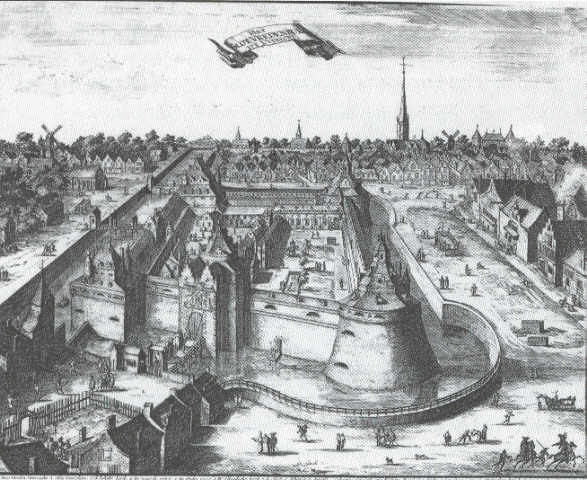 Holy Roman Emperor, Charles V, with Rombout Keldermans and his architect, erected the fortification in the city of Utrecht sometime after 1528 in order to keep the citizens in check. The fort was ultimately destroyed by fire in a riot by the citizens in 1577. A piece of the wall still remains, and the site of the castle is now the focal point of the city. The surrounding neighborhood is still known as Vredenburg, which leads me to believe that the Van Vredenburg surname originated from this area. However, there is also evidence of an Augustinian monastery named Vredenburgh in Boeimeer, between Princehage and Ginneken built in 1467, but plundered and destroyed by fire during the siege of Breda in 1577. We just got back form a trip to NY to search Don's Vredenburg roots. I also recently got a letter from Harry Vredingburgh. Coincidence? I am sending him this info, too. I feel fairly confident that we have made some progress in this area. We can lay to rest the myth that Joseph Vredenburg came to the US in 1830. I don't know where that come from, but it has been accepted as fact in Don's family for many years. Hate to burst their bubble, but the evidence speaks for itself. There seems to have been only one Vredenburg (you should see the variation in spellings!) family in Chemung / Tioga County, starting before 1810, the earliest census in which they appear there. By following the census through, I have come to the conclusion that the original settler in the then Tioga (later Chemung) County was John Vredenburg. He evidently had three girls (no names found) and then three boys: Hernando, George, and Joseph (our Joseph). In the 1840 census, I found an old lady named Abby Vredenburg living alone, so this must be his widow. I could find no cemetery records for them, or land records. The census did say he was not engaged in agriculture or commerce. What else was there? My next step is to try and find out which John Vredenburg (there were 8 of them in the 1800 NY census index) fits the description of this one and where he might have come from. I did find Hernando's probate of his estate in Chemung County. His widow was Eleanor, and children: William, Alfred, and Arden of Van Etten (Chemung County), Elizabeth, a minor, Harrison, of Erin, Chemung County, Myron P. of Ft. Wayne, IN, James of Schuyler County, NY, and Delia of Van Etten, a minor. Also Ira Sanford V, who was also his administrator along with John Forsythe. Hernando evidently had a sawmill and according to the town historian, was known as "Nan." He is buried in Rumsey-Swartwood Cenetery. We didn't find it - may have been the one washed away by the river! Two of Joseph's young children and his in-laws are buried in Austin Hill Cemetery. George moved on - maybe to Steuben County. I have a name of a lady in MI who is descended from him and I am going to write to her. Information given to me by the Steuben County clerk indicates that George's wife was Malinda, and children: Elizabeth, William F., George H., Charles, James W., Sarah J., Casedancy, and Mary E.
I also found a couple of other tidbits that you may or may not have Sullivan's army roster of the Revolutionary war had two Vredenburgs listed: Private James Fredenburgh of 4th NY Regt., 1st Company, and private William Vredenburg of 3rd NY Regt., 7th Company. There is a John V. Fradenburgh, of Company D, 32 NY Inf. Buried in the military cemetery in Bath, NY, date of death 27 Sep 1909. Does anyone have any information on a Franklin / Frank / Frances Vredenburg of Van Etten, Chemung who was in the Civil War? I wrote for his military (pension) papers and got nothing. So I wrote back for his military record and got this: he was wounded at Antietam, sent to Philadelphia Hospital, from which he deserted. I am pretty sure he is Joseph's son Franklin (there were a lot of Frankilin Vredenburgs about then) who, according to Don's dad "went west and was never heard from again." I thought I might have found him in the Santa Clara CA guy, but evidently there is enough evidence to link that one to William and Betsy. Although one of Joseph's daughters lived in Santa Cruz about the same time. We found that out by a careful study of Rensselear V's diary of hen he was visiting her out there. Glad I transcribed that, as the cousin who had it had his safe broken into, and it was stolen. Her married name was Mary Jane Hodgdon. I am having a hard time with some of Joseph's children. In the censuses their names keep changing, but enough are the same that I know it is the same family. In 1850, he had a wife, Anna, age 40, born NY and children: Mary Ann, 16; Eliza, 14; Mary J., 12; Franklin, 10. In 1855, he had wife Sally Ann (Sweezy - she was still living with her parents in 1850, so Anna must have died). Children: Chloe A. (already married to William Rockwell. She d. in Mecosta County, MI in 1876); Susan, 16; Mary, 10; Franklin, 12; Vati, 5; Vanrenselear, 3; and William, 1 (died in 1859, buried in Austin Hill). In 1860, he had wife Sally Ann, children: Elizabeth, 18; Mary J., 14; Augusta, 10; and Rensseler, 8 (Don's great-great grandfather). I have not yet looked at them in 1865 state census. I couldn't find them in Chemung, but found out on our trip that they moved to Barton, Tioga, so I need to get the film and look there. In 1870, Joseph was living in Mecosta County, MI with Thomas and Susan (age 30) Bouyer. I can't find the Bouyers again. I suspect she is the same Susan listed as a daughter in 1855, but have no idea where they went. I also cannot find Rensseler and Sally Ann in 1870 (according to he gravestone, she died in 1871). Mary J. was living with Orange and Angeline Wheeler in Mecosta County, in 1870. I can't establish a relationship for them, either. I also lost track of Elizabeth, though she married Francis C. Mitchell and lived in Mecosta County. Are you thoroughly confused? We really enjoyed seeing the area Don's ancestors came from. Had no trouble figuring out why Michigan might have appealed to them. I wouldn't want to farm those hills! I'm going to try to run off a printout of what I have on disk (as up-to-date as those who are cooperative about sending me info.). I have two genealogy programs. Personal Roots is what I started with, and have al Joseph V's descendants on that. Then I got Brothers Keeper and have just the immediate descendants and all the ancestors on that. Haven't figured how to combine them yet, and am not sure if I want to. Thanks for writing, and hope I have given you some new stuff. Date: 31 Dec 1930 - 6:30 a.m.
Burial: Roosevelt Cemetery, 18255 S. Vermont Avenue, Los Angeles, 6 July 1937. Born: 27 Mar 1900, age 47 yrs, 7 mos, 11 days. Veteran: World War I and II.